Sin will overcome us if we slay such aggressors. Therefore it is not proper for us to kill the sons of Dhrtarastra and our friends. What should we gain, O Krishna , husband of the goddess of fortune, and how could we be happy by killing our own kinsmen? Papam is sinful activities, and punyam is pious activities. Before doing any activity, we should consider, “Is this papam or punyam, sinful or pious?” But the asuras, or demons, do not care for such things. Pravrttim ca nivrttim ca na vidur asura janah (Gita 16.7). They think, “I like it; I must do it.” They do not refer to any authority. Impious activities degrade us. 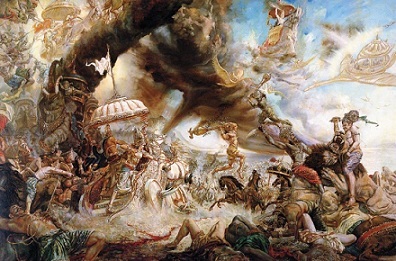 Jaghanya-guna-vrtti-sthah adho gacchanti tamasah (Gita 14.18). But people do not know. Killing is an impious, sinful activity, but in the name of religion, killing is also going on. Even the so-called religious priests either support killing or condone it. Visnu-bhaktah smrto daiva asuras tad-viparyayah. There are two kinds of men: devata, or demigod, and asura, or demon. A Vaisnava is a devata. Arjuna is devata because he is visnubhakta. Devotees of Lord Visnu are called devata. Demigods like Indra, Candra, Surya, and all the thirty-three crores demigods in the higher planetary system are all visnu-bhakta are devatas. They will abide by the orders of Visnu and Vaisnava. As soon as Indra heard these words from Narada Muni, he circumambulated Kayadhu, offered their obeisances to her and the child within, and released her. This is Vaisnava behavior – they completed trusted Narada Muni’s words and followed his order. But the asuras would not do this – that is the difference between devata and asura. In the Sixteen Chapter of the Bhagavadgita, you will find a description of the asura: pravrttim ca nivrttim ca na vidur asura janah (Gita 16.7). Pravrtti means what to do, and nivrtti means what not to do. The asuras do not care to know this, so they do anything for their sense gratification. Therefore they become entangled. Foolish people think that they are free to act as they like, but that is not possible. The spirit soul bewildered by the inﬂuence of false ego thinks himself the doer of activities that are in actuality carried out by the three modes of material nature. The sons of Dhrtarastra had insulted Draupadi during the gambling match. But Krishna saved her by supplying her sari, one after another, one after another, heaps of sari. Finally they gave up. They were actually atatayinah and deserved to be killed. We see a similar story in Ramayana. 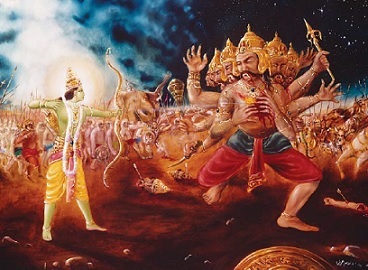 When Ravana kidnapped Sita, Lord Ramacandra could have created hundreds and thousands of Sitas and married them – He is the Supreme Personality of Godhead. Krishna ’s Radharani or Lord Ramacandra’s Sitadevi, Narayana’s Laksmidevi, they are pleasure potency of the Supreme Personality of Godhead. But to set the right example, Lord Ramacandra killed not only Ravana, but the whole dynasty – just for the sake of one woman. He did this in order to teach people that anyone, if he is an aggressor, must be killed. “My dear Krishna , I am so unfortunate. I got this human form of life. It was meant for developing Krishna consciousness. But I have wasted my time otherwise. How it is so? Janiya suniya visa khainu: “Knowingly I have taken poison.” Labdhva sudurlabham idam bahusambhavante, manusyam arthadam (Bhagavatam 11.9.29). Because the people are asuras, they do not know what to do in this human form of life and what not to do. They are killing animals without any hesitation. And still they are spiritual leaders. Just imagine how horrible the condition in this Kali-yuga is. Without any restriction or consideration, they are committing sinful life. They do not that in their next life, all this arrogance and pride will be finished. He will have to accept another body, which will be offered by the material nature. You cannot say, “I will not accept this body; I want this body.” No. Nature is not under your dictation. You have to abide by the dictation of nature. For every little action, you are responsible. It is being noted by the material nature. Therefore Arjuna is considering whether it is good to kill his family members. “My dear Krishna , do you think by killing my family men, my relatives, I shall be happy? You are Madhava. You are always happy because You are the husband of goddess of fortune. But do you think I shall be happy in this way?” This is consultation. A devotee is always a devata, demigod. All good qualities develop in such a person. Sarvair gunais tatra samasate surah (Bhagavatam 5.18.12). Sura means devata. A devotee of Krishna will never accept that killing is very good. He follows ahimsa, nonviolence. One who becomes a devotee of Krishna , or Krishna conscious, all these good qualities will develop in him. People are trying to elevate the status of the society by so many things. But they do not know the secret. The secret is that if one is trained to become a devotee of Krishna , all good qualities automatically will be visible in his person. There is no need of separate endeavor, how to make a man honest, how to make a man religious, how to make a man high-thinking, simple living. samo damas, titiksa arjavam jnanam vijnanam astikyam (Gita 18.42). All these qualities immediately develop, because a living entity, the spirit soul, is part and parcel of Krishna. Aham bija-pradah pita (Gita 14.4): “I am the seed-giving father.” Just as a father injects the living entity into the womb of the mother, and the mother, by her blood, develops the body of the child, so all these living entities, 8,400,000 species, are born from the body of material nature. We should not consider the animals or trees or birds and beasts to be different than ourselves. They are our brothers, because the seedgiving father is Krishna , and the mother is material nature. We have got the same father and same mother. Therefore we are all brothers and sisters. So unless one is advanced in spiritual consciousness, how can he think of universal brotherhood? There is no possibility. Real universal brotherhood is possible when one is Krishna conscious, when one knows that Krishna is the common father of everyone. Suppose a father has ten sons. Out of them one or two sons are useless. So the other eight sons come and complain to the father, “My dear father, these two sons of yours are useless. Let us cut their throat and eat.” But the father will never agree. He will say, “Let them be useless, but let them live at my cost. Why? You have no right to infringe on their rights.” This is common sense. But the fools think that animals are to be killed for the satisfaction of the tongue of the human being. No sense. And still they are passing on as religious heads. Such type of cheating religion is completely kicked out from this Bhagavata religion. Dharmah projjhita-kaitavo atra paramo nirmatsaranam (Bhagavatam 1.1.2). Krishna consciousness movement is meant for the paramo nirmatsaranam, those who are not envious. One who has understood what is this creation, who is the creator, what are these living entities, is called paramahamsa. How can a paramahamsa be envious of others? Therefore it is said paramo nirmatsaranam. Matsarata means envy. Without becoming a Vaisnava, without becoming a devotee of Krishna , do not think that anyone is a human being. He is simply an animal.